It hurts and pinches my heart when I saw violence in my city. A city which was once regarded as a city of light, a city which never sleeps now constantly in the grip of violence where person carrying sophisticated & modern weapons roaming freely on city streets looting the citizen at will, barging people homes & workplaces freely and running away with hard earned cash & other valuables. This city is transformed not as per the wishes of the people but this transformation is more because of the political & other elements who want to rule the city and its people. These elements not realizing that love & care are the method to attain public support on a long term basis. Karachi was a city where we roam around freely day & night without any fear, families go out fearlessly, this was a city which was termed a big hearted city capable of incorporating loads of people with expediency like a mother who take all its children and hide them under its wings. Karachi faced a huge influx of population at the time of Independence, city in those days was devoid of infrastructure, camps were set up and people coming to city were accommodated in those camps. Those who were already residing in the city welcome the evacuees with open arms and create an environment where ever one lived with harmony. People love each other and were always ready to put forward a helping hand. Barring some very rare incidence of violence, city mostly remain peaceful till 1980s.This was the time when USSR invaded Afghanistan and Pakistan being a neighboring country of Afghanistan felt the effects of this war. We not only entered the war fully on the pretext of Jihad to please USA but also have to bear the burden of huge number of Afghan refugees. Taking care of these refugees has extremely negative impact on economy and also on country’s resources. Another negative aspect was that our government failed to contain these Afghan refugees to any particular city or to the refugees camps and these people were spread in whole of the country especially to the major cities in search of livelihood. The spread of these refugees promote drugs, ammunition and trade of smuggled goods. Karachi being a motherly city accept all these refugees with open arms but was unaware that how its new residents negatively impact the existing citizen. Drug culture was on the rise and a very large number of city’s youth start using heroin. On the outskirts of the city markets were established where smuggled items were easily available and this market not only hurt the local industry but also negatively impacted the items coming through legal channels and all this negatively impacted the economy. The Afghan refugees from the money earned bought properties in the cities and slowly but surely increase their stakes here. This in my view is the foundation of land mafia. As population grow enormously, so does the needs of citizens increased. The need for food and clothing is handled as we being an agriculture based economy are self sufficient in food crops and also our textile industry was in a fine shape to meet the clothing requirement of people but providing shelter was a difficult task and that is where the city dynamics changed. Some person or institution may analyze that this city need not houses or bungalows but it require huge apartment complexes to fulfill residential needs of the citizens. Once this trend of living in apartments gets rooted among the masses builders & developers blindly start construction and for their sake, they also get customers willing to buy these apartments. As construction of apartment complexes rise, price of land witnessed exorbitant increase and this un expected increase in land price lead to land grabbing & fraudulent sale of property. Land grabbers are mostly powerful persons or group having strong support so to get the land evacuated some time claimants retort to violence & gun battles. Initially this violence was restricted to particular area but later on when political parties of the city start indulging in these matters, things started to go out of hand and also violence or firing if it start in a certain area of the city doesn’t stop there but spread to whole of the city rapidly. 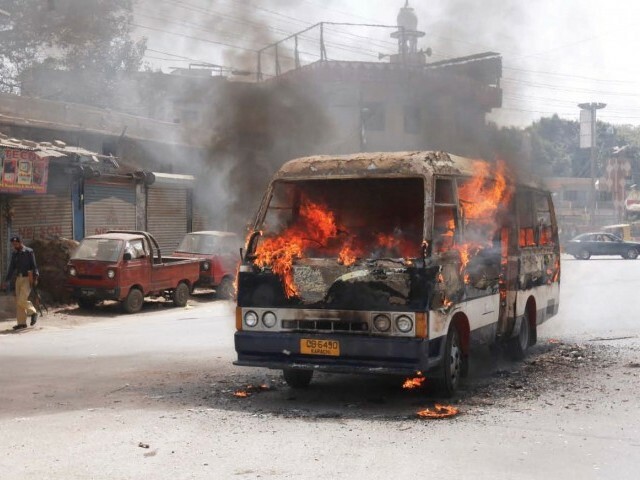 Karachi saw many operations carried out by law enforcement agencies and these operations play a positive role in curbing violence in the city and keeping it peaceful so that life remain normal and people move around the city without fear. After a long time Karachi witness a relative period of calm & harmony from 2002 to 2008.Although some sporadic incidence happened in that period also but overall environment was good and a lot of development was done in this period. After the elections in February 2008, it was expected that city will remain on the path of harmony and citizens continue e to enjoy threat free movement. Sadly these expectations failed miserably and city for the last four year is constantly witnessing bloodshed. Violence erupts every second or third month and no government institution able to control it before 15-20 killings and 25-30 burnt vehicles. This is an extremely sad state of affairs as families are losing their loved ones who in most of the cases are the bread earners also. This is a double loss as family not only lose its loved one but also losses it financial independence. We the citizens of Karachi are now too much frustrated & depressed with what is going on in the city and appeal to all those who are at the helm of affairs to sit together and honestly try to find out the solution of all the problems this city which is termed as mini Pakistan is facing. Citizens of the city are facing traumas and various types of diseases because of the environment of fear in which they are forced to live because of the prevailing situation. 2) Law enforcement agencies should be given free hand to take action against suspects & criminals without any fear or any political pressure. 3) All non-Pakistanis specially the Afghan refugees be traced and send back to Afghanistan. 5) Land grabbers & drug peddlers must be identified and dealt with sternly. 6) Neighbors interact with each other regularly in order to be well informed about their respective areas. I want my peaceful & loving Karachi back from the clutches of violence, lawlessness & fear. I want Karachi of my childhood where people were willing to help out any one they saw in trouble even the strangers as there was no or very limited fear or threat of burglars, snatcher, dacoits or terrorists. I hope if my above mentioned suggestion may be followed in letter & spirit and law enforcement agencies & government fearlessly try to restore normalcy in the city, situation will improve drastically and our city will once again become the City of Lights.